So, it is 1955 and Shirley is an unmarried Mother which was big deal though certainly not unheard of in those days. We are living on a council estate in Sheepridge, Huddersfield at 12, Crest Hill Road. On a visit there about 10 years ago it was like visiting another planet or like something out of ‘A Clockwork Orange’ – very creepy. But, I believe all the old houses have now been demolished and smarter more modern homes stand there. But, that area and The Maypole pub on the estate was a ‘no-go’ area in the 70’s and maybe 80’s. My memories of living on Crest Hill Road are vague. But, it must have housed my Nannan (b. 1914) (she had split with her husband Christopher who apparently used to beat her. I had never seen a photograph of him until September 2010 when my Auntie Sandra and Uncle Peter sent me the old photographs you see in this blog and I certainly never met him); my mother Shirley (b. 1936) and her sisters Gloria (b. 1941), Sandra (b. 1943), Laraine (b. 1945) and the twins Janet and Jennifer (b. 1947). There was a brother too called Cyril (b. 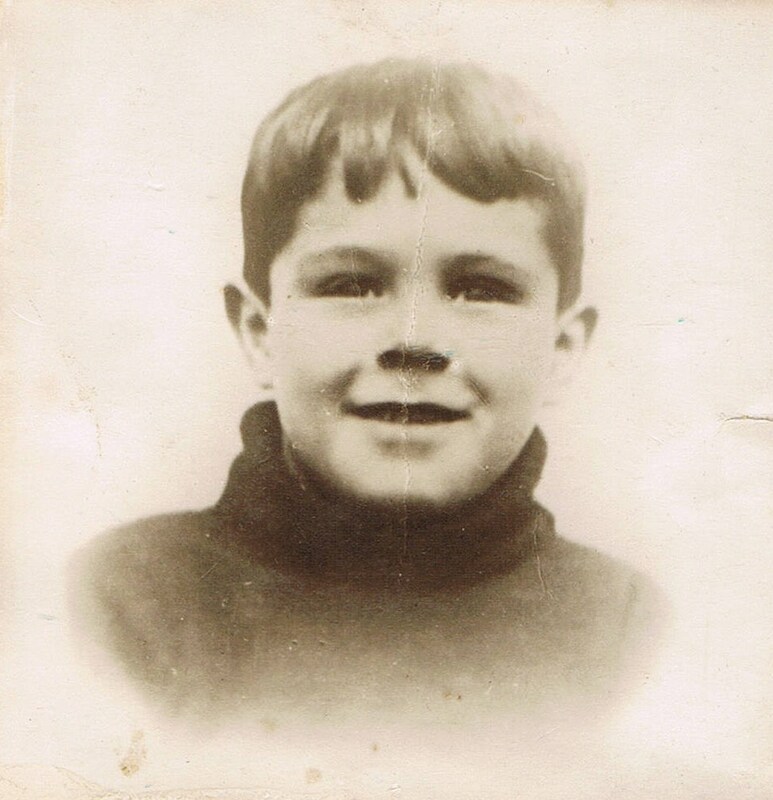 1934) but he died aged 7 years in a drowning accident whilst playing at a local dam which is now situated below the huge ASDA car park off Bradford Road not far from the house. Apparently he fell in or was swimming when he his foot/ leg was caught in an underwater pipe. So sad! My Mother Shirley (b. 1936/ d. 2010) in happier times wearing my cowboy boots in Mallorca in 1988. Auntie Janet (b. 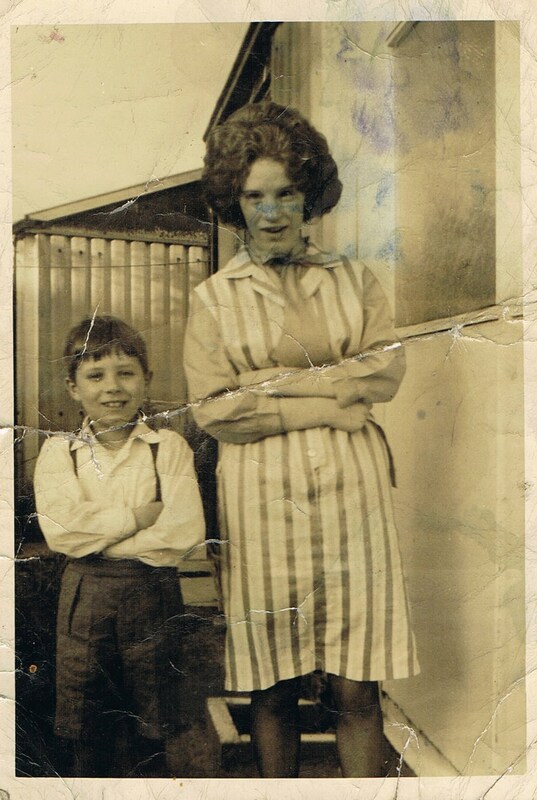 1947) and twin to Jennifer below, and me outside the prefab Sept 25th 1963. Auntie Jennifer (b. 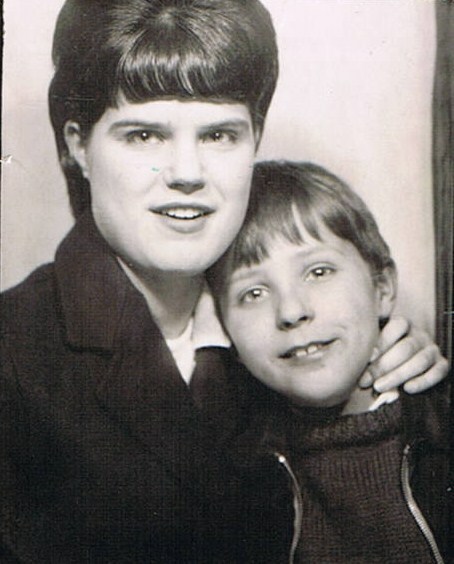 1947) twin to Janet above with me sometime in the 1960’s. 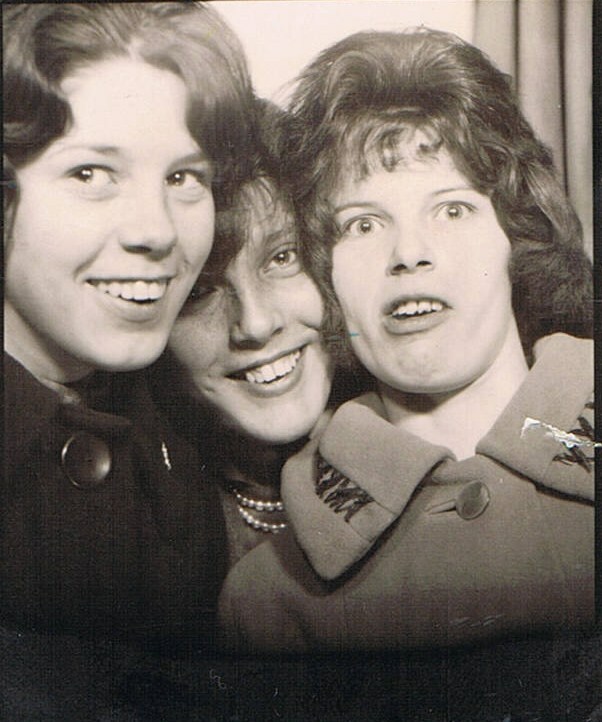 (from left to right): Aunties – Sandra (b. 1943); Laraine (b. 1945/ d. 2000) and, Gloria (b. 1941) taken in the 1960’s. Uncle Cyril (b. 1934/ d. 1941?) who drowned as a youngster aged 7 years. We never met, of course. So, there were 8 of us in one council house. I have no idea how many bedrooms it had but we had to have been cramped but we weren’t to stay there long because the story goes that my Nannan was most annoyed at my Mother for getting pregnant and issued the warning ‘You get pregnant again and you will be thrown out!’. This was to echo its way down the years to me being thrown out by my Mother in 1994. But not by getting pregnant I hasten to add! Now, as I say I can’t remember that much from living at Crest Hill Road – I have a very, very vague memory of having my nappy changed by one of my Aunties. I know it wasn’t my Mother. How strange that I would remember this. I do remember my Nannan checking the girls’ bottoms for worms too and wondered why she didn’t check mine. I remember black cockroaches at the bottom of the stairs by the door. I also remember a single-bed with a green an iron bedstead in one of the bedrooms – not sure if I slept in that one but I suspect I did because I do remember it. I think it was the Sallises too who took me on a car ride once into the countryside to a farm where I saw lots of lovely furry, feathery golden chicks. They also had a fish-tank in their front-room in which they had an eel which I was terrified and fascinated by. It must have been at this time that I went to nursery in Huddersfield and apparently my Auntie Sandra was one of those that took me because, of course some of the girls were still at school and my Mother had to go out to work. If I remember correctly my Mother worked as ‘cloth-mender’ or ‘mender’ in a cotton mill, which I know she did a few years later at home. (Indeed I only found out at her funeral in Dec 2010 that my Mother worked as a young woman as a ‘welder’ too!) The ‘cloth-mending’ involved a huge roll of what always seemed like navy-blue cloth with pin-stripes which she would have to unravel and check for imperfections by drawing a circle around then with what I presume was tailor’s chalk. It must have been a God-awful mind-numbingly repetitive job but I suppose it was a job and money was coming in to feed and clothe us both as well as pay rent to my Nannan. Now, what I remember of the nursery again is very little but we used to have a ‘siesta’ during the day and we would have to get these camp beds out and sleep on those. Once when we were resting outside I ate a clump of grass and ended up throwing up. You stupid boy! We also had to be bathed; I am not sure how often; but I have been told that one time I turned lots of taps on full and flooded the bathroom area. I, also remember at the end of my tenure there we had what seemed like a wonderful inside playground erected and I can remember I had heard the word ‘dysentery’ and was repeating it to a girl at the top of the slide – well, that’s how it would be in the film. The only other thing I can remember is someone, maybe my Mother coming to pick me up and I can see a woman in a turban – not a Sikh type turban – the kind that ‘mill girls’ did wear in those days called ‘a pudding cloth’ (thanks Sandra for that information – I hadn’t heard that!). This photo is a screen-grab from Ken Russell’s 1975 film ‘Tommy’. My Mother then gets pregnant again which is probably the downfall of her relationship with her Mother, my Nannan to whom she wasn’t to speak to for the next 20 or so years. As alluded to above this pattern was being repeated with me and my mother – we clocked up 16 years of not talking but not through want of trying on my behalf. No matter how hard I tried she just didn’t want to know. I did get say ‘goodbye’ to her before she died. But, more about that later.